What a weekend! Visitors from all over Massachusetts came out to the Jamaica Plain Open Studios September 28th and 29th to support local artists, artisans, and craftspeople. Four members of Boston Handmade were showing and selling at the weekend event - Betsy Baker of Stonehouse Studio and Jessica Burko of Reclaimed To You were exhibiting together in the Carriage House on Brewer Street along with seven other artists and artisans. Of the experience Betsy said, "JPOS was the perfect show! 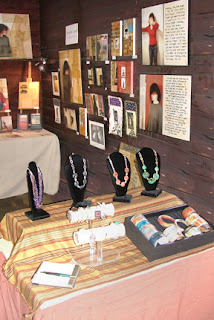 An old carriage house showcased our work beautifully, the weather was gorgeous and the crowds appreciative. JP is truly artist heaven!" 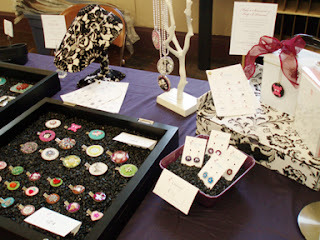 Jen Hill of JHill Design exhibited her work at Fire Opal on Centre Street. She said, "It was great to meet a lot of new people and hear their feedback on my work. Since my art is all about imaginary vacations it was wonderful to hear stories of people's real vacations and also to talk about how my prints evoked a memory from past trips." 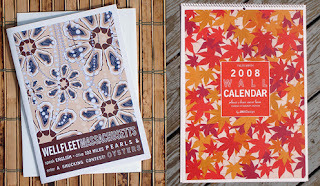 JHill Design's top selling items for the weekend were her 2008 wall calendar and the Wellfleet print. Karalee Serra of Karalee Designs had her work at the group site in the Central Congregational Church and she was most impressed with a spoken word performance by the group 'Rhythm Fire' and she exclaimed, "The spoken word performance by Rhythm Fire was excellent!" To learn more about open studios events in the Boston area check out the City Of Boston site.